We still will have on more chance of enjoying the beach this morning before going to Krabi’s airport to get in our flight back to Bangkok. Once in the city, we will visit the missing spots. We have no need of waking up early today so we are in the breakfast buffet a few minutes before its end time. Then we just come back to our room and relax. 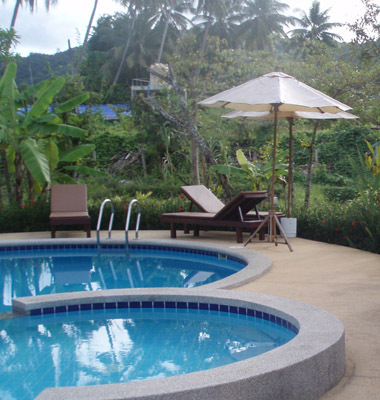 With our baggage ready we are in a walk through the garden until 10:30 AM, the time we’ve scheduled with hotel desk the shuttle to Krabi airport. After a 30 minutes ride we can see Krabi town for first and last time from the car. The airport is small and simple and we find out the staff from the hotel have been quite cautious with the time as we’re ready to board one hour before the boarding time: 12 PM. We can see the whole boarding area from our seats and there is a stand offering two kinds of sorbet, it says they’re free for Bangkok Airways passengers. If this is the only advantage the drinks are well paid with the price difference. Everything goes on time: boarding, taking off, the delivery of the lunch I’ve paid through Airasia website - which is good -, and landing. We’ve just landed in Suvarnabhumi International airport for a second time, but this is the first we will need a taxi. There is no problem for it, following the taxi signs we reach the area where a woman in a stand in the street asks us where are we going and write the destination in a form in Thai language and gives it to the man who address us to the pink car he is working with. His English is not good but he makes an effort for having a conversation and asks us if there is our first time in Bangkok. I explain, in the simplest way I can find, we’ve actually returned to the city for our way back to home. A few minutes later we’re in President Palace Hotel’s desk for checking in and getting back the bag we left there one week ago. We can check our room is smaller than the one we got previously as it has no living room, and when I ask about it I’m explained we got an upgrade the first time, although I don’t understand why. I’m glad it was when coming for two nights more than for this one single night. Our plan is spending this afternoon and the whole day tomorrow shopping by Bankok, so we reach the sky train with no pause with the security of given by the experience and go out in Chit Lom station, just two stops away, to start our plan in the popular Pratunam market. 1- At ground level we find the road and that is for cars. Pedestrians have small place here as there are no facilities to move across the streets. There is a narrow space in the sidewalks as they’re conquered by the street markets selling, food, clothes or any other thing. 2- Above that first level there is a network of platforms with multiple accesses to one level up or down. This is the level for pedestrian and it is like this in a way that even some accesses go directly to the buildings and shopping malls with no need of going downstairs to the ground. 3- The upper levels are for Sky train and I’m using the plural because in this area there are two lines, one below the other. If there is no sky train then third level up is for cars, in motorways linking to the highways going out of the city. I remember the first time I meet one of this motorway when I came in to Bangkok by car from Cambodia, like a week ago, and how I finally went down to the lowest level because I felt so disoriented and looked for the slower but full-of-references world of the ground. We walk Thanon Ratchdamri Street in our way to Pratunam where we can see a big shopping mall decorated for Christmas, with penguins and fake snow everywhere. I think most locals do not know real snow as this thirty-something degrees is what they call cold season. The sidewalk is full with the market in this area too regardless of the shopping malls around. We stop in one place with the silk dress we were looking for since first day. We’ve finally found it! Now it is my turn to act as if we are not going to buy it. I do my best here and, from the initial 2000 Baht we purchase it by the 800 I promised to pay for it two weeks ago. It has been so easy I really think it could be got cheaper. We’re happy as I got my promise, my wife has got her dress and we’ve got a silk silver shirt as well for me by 6€. We haven’t been in Pratunam market yet and we’re already carrying bags. 1- Pratunam: This is a shopping mall looking as one would expect with the ideas about Asian South East: a warren of small stores in multiple levels with so many stock that people can barely get in them. This is mostly for cloths and we couldn’t see any of the known brands. In our only try, bargaining was not accepted and we left without buying a thing. 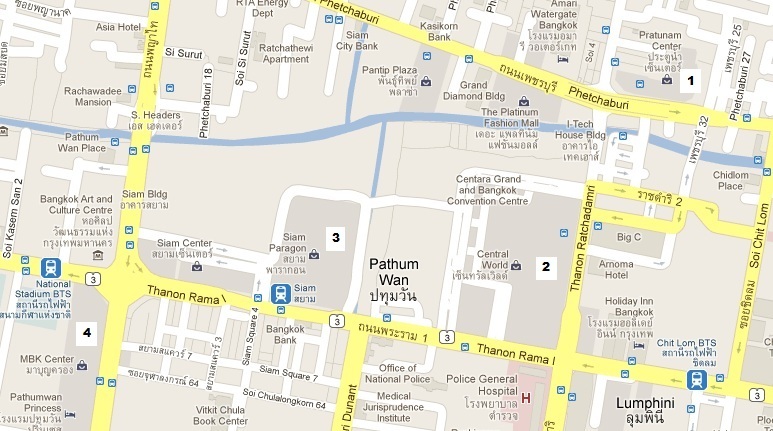 2- Central World: Although it can see big in the surface in the map above, it is not. Most of that area belongs to the courtyard in front full of Christmas decorations. Inside it is fancy, clean and luxury, looking almost the opposite of the previous one. There are a few of stores with a lot of space. The floors are all around the walls, leaving a big empty space in the middle from which the floors seem just balconies. There are a couple of pictures of it in the next page. This was not looking as our shopping malls, but superior. 3- Siam Paragon: This looks exactly as our shopping malls, the good ones. Bigger than the others with complete floors full of stores of the most popular brands. The prices are also high level here: we took a coffee by 2€ in the floor of the restaurants. 4- MBK: This looks as the idea we can have of an Asian shopping mall. This is not for cloths, there is everything here, with a lot of tech stores too. I’m looking for fake watches to compare with the ones we brought from Cambodia, but I only can find plastic ones with digital screen, can be all same color or customized with Mickey Mouse or Hello Kitty, and all of them cost 1€. But comparing prices, a flat screen TV has the same price then in Spain. I cannot see an advantage in purchasing here tech. We come back to our hotel for a rest.